solid unique violet blue color. Between these two pigment patterns there is an inner ring of dark purple pigments. Image Copyright © 2008 by Reeffarmers All Rights Reserved. The Limb of the Sun has an absolutely amazing and unique pigmentation pattern for a brain-type of stony coral. The prominent ridges inbetween the corallites are colored a solid red. Very unique for this type of brain. These ridges also have distinctive grooves that are perpindicular to the ridge. The corallite centers are a solid bright violet blue. This combination of pigments is very unique. Reeffarmers acquired a colony of this coral from Clint at Diamonds in the Reef. We split our colony with a private collector located in Los Angeles. Clint has been working directly with a collector in Sulawesi Indonesia. That collector had been holding this coral for a few months prior to Clint importing it directly. The corals marketing name was coined by Clint. This particular coral was adapted to captive systems when Reeffarmers had acquired it. 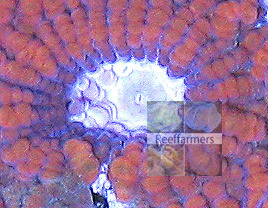 The coral also fragments very well and Reeffarmers will be producing captive grown fragments of this coral for years. It has maintained its pigmentation very well. 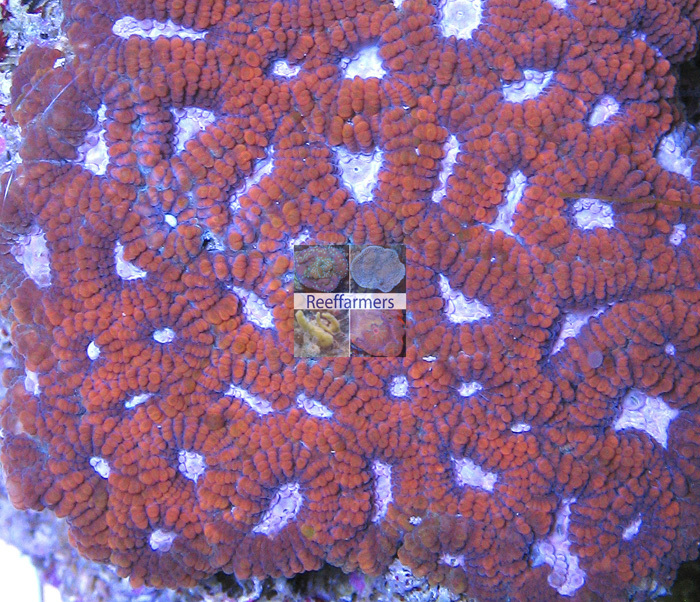 Reeffarmers currently believes this might be a Favia rotumana species coral. Steve Tyree is maintaining a seed section of the Limb of the Sun for Reeffarmers.com in an 125 gallon naturally filtered Tri-Zonal Reef Aquarium. In Steve's captive reef the coral is positioned to receive Weak to moderate light under a 400 watt 20,000 K Radium Metal Halide. The coral appears to require weak to Moderate illumination to retain its coloration. The price is $70.00 per small fragment. Please note Reeffarmers is no longer taking new reservations for new corals. The current economic conditions are not supportive for reservations that extend for a few years into the future. After this first edition is distributed, we will sell future captive produced fragments on either our Buy It Now page or via another silent auction. We will still list exotic corals as Limited Editions and will continue to build web pages for them. Limb of the Sun Reeffarmers Seed Corallite Closeup. The solid violet blue corallite center can easily be seen in this image. red ridge pigments and the inner violet blue pigments. Image Copyright © 2008 by Reeffarmers All Rights Reserved. Auction Third Edition Auctioned for $50.00 through CFM Auctions. To inquire about this farmed fragment please send an email to reeffarmers@aceweb.com. Copyright © 2010 by ReefFarmers All Rights Reserved.